The town of East Grinstead sits on a sandstone hill in the north east corner of West Sussex, right next to East Sussex and the county borders of Kent and Surrey. It has a population of around 27,000 people. The town contains many historic buildings including St. Swithin's Church whose tower dominates the town's skyline. It is also home to one of the longest continuous runs of 14th century timber buildings in England. The town has a train station which is served by trains running on the main London Victoria to Brighton line, and since 2013 it also has an additional platform which forms part of the Bluebell Railway route. The historic railway is run largely by volunteers and has the second largest collection of steam locomotives in the country (the largest is the National Railway Museum in York who have over 100). It also has around 150 wagons and carriages. As far as cycling is concerned, the town is connected west towards Crawley by the Worth Way and to the east towards Groombridge via the Forest Way - these are both linear Country Parks which run along the route of the former Three Bridges to Tunbridge Wells train line, and are part of the Sustrans cycle network. The Georgian mansion was built in 1769 by lawyer John Cranston on land which was owned by his wife's family (Estcot's Farm). Over time the mansion went through a period of disrepair followed by restoration, and requisition by the army during the Second World War. Finally the mansion and grounds were given to the town by philanthropist Alfred Wagg in honour of the men, women and children who lost their lives during the war. 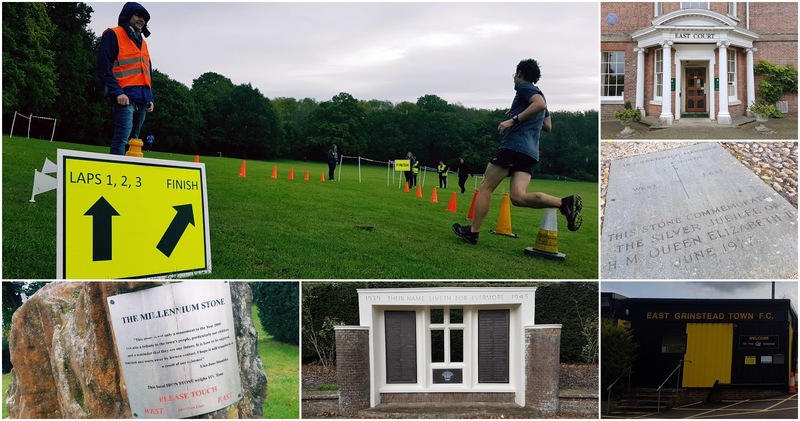 The current estate is recorded as being 48.6 acres in size and on the 9th of September 2017 became home to a free, 5k event called East Grinstead parkrun. 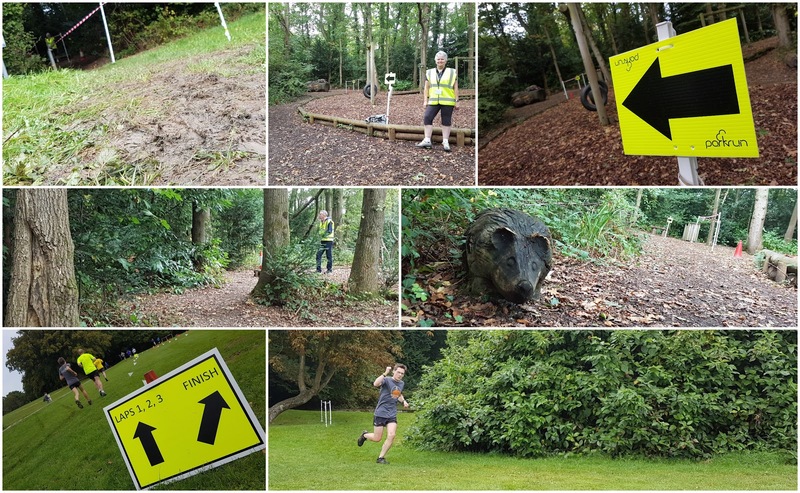 We drove over to the town on 23 September 2017 to take part in event 3 and following the instructions given on the official course page, we parked in the East Grinstead Town Football Club car park which is adjacent to the parkland. It's worth checking a map beforehand because the walk to the park may not initially be obvious. 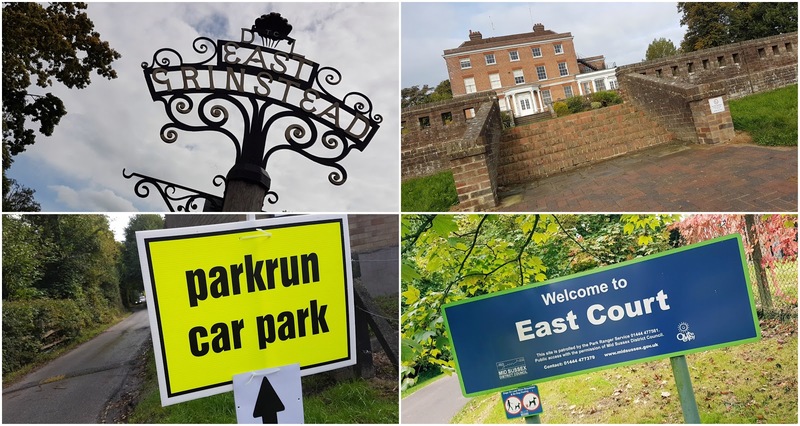 Another point is that the official postcode (RH19 3LS) might take you to the main East Court Mansion car park which, strictly speaking, should only be used by people using the mansion itself (look for the parkrun car park signs when entering to ensure you park in the right place). Upon entering the grounds I headed for the toilets which are located in a block in the mansion car park. Heading past the mansion and onto its east-facing terrace, the beautiful view across the grounds and beyond can be seen. In the distance, to the South East, is Ashdown Forest which is where the Winnie the Pooh stories are set. The grounds are divided into two halves by a private road that leads to the pavilion - the eastern half is the upper field and this slopes down towards the lower field which is flatter and is home to a number of marked football fields. The meeting place for the run is next to the sports pavilion which is down on the lower field. 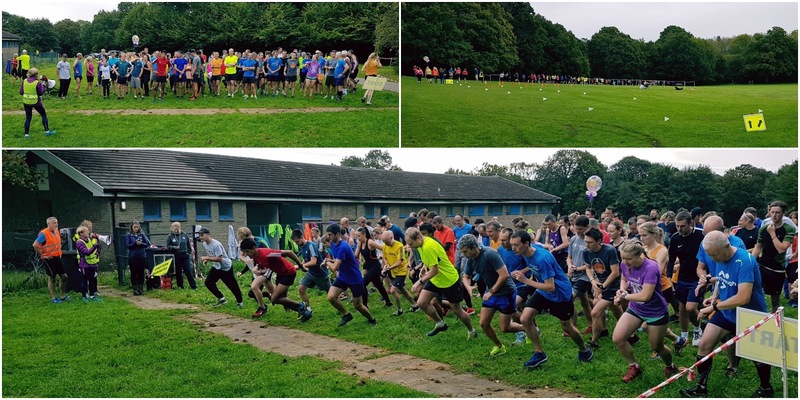 The run itself takes place over one small lap around the lower field followed by two large laps around both the lower and upper fields. At least that's one way to describe it. One of the marshals I was talking to had memorised it as 'two laps of the lower field, one lap of the upper field, another lap of the lower field, followed by a final lap of the upper field. Underfoot is mostly grass and dirt paths, but there's also a short section on a paved brick path. The terrain is undulating/hilly. A friend of mine described it as 'a bit cross-country' and I can't really argue with that. We were told during the run briefing that all the red/white tape should be kept to our right and the yellow/black tape on our left. Once the main run briefing had taken place, the participants were sent on their way around the park. The lap of the lower field is mostly run on grass but there are a couple of spots where the course cuts through short sections of woodland. At the very bottom of the course, the grass was a little muddy - bear in mind I ran here in September after a period of relatively dry weather, so in the winter it's going to get really muddy. Also if the footballers are using the pitches keep your eyes peeled for wayward footballs rolling or flying onto the parkrun route. The lap of the upper field starts with a longer section through another wooded area (and playground) before climbing up towards the mansion - as with the lower field, this section was already quite muddy. Turning to run adjacent to the mansion on a paved path, the course now runs just a few metres from the Greenwich Meridian which passes directly through the terrace. Also next to the mansion is the War Memorial which is certainly worth a few minutes of your time after the run. The upper field lap is rounded off by heading back down towards the centre of the park, then adjacent to the central road before heading back into the wooded section. Finally it circumnavigates the pavilion car park (not for parkrun use) and heads back around to the start area, into the finish funnel approach and across the line. I have to admit that it was a tough course to run but at the same time it was brilliant preparation for the upcoming cross-country season. I wore my trail shoes for this run and these were the right choice, but when winter arrives, the course will surely get a lot muddier - I'm going to stick my neck out and say it'll be a mud bath in places. In the winter I would imagine spikes would be the best footwear choice - I reckon the paved path could mostly be avoided by sticking to the grass, however it would be best to check beforehand that there are no objections to spikes being used here. 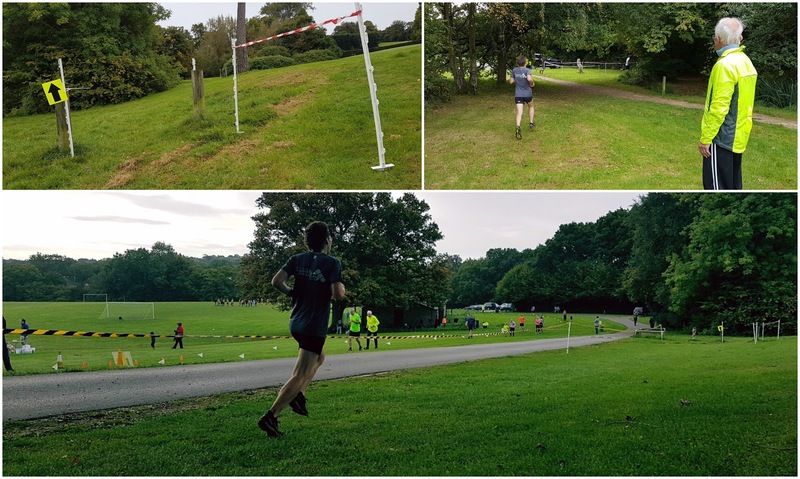 I recorded the run with my Garmin and upload the data to Strava, which you can view here: East Grinstead parkrun GPS data. I also used the data to create a #relive fly-by video and you can view that here: East Grinstead parkrun fly-by video. Event 3 was attended by 115 people and the full results were online a few hours after the event. After exploring a bit more and taking a photo standing with one foot in each hemisphere, we headed back down to the official car park and popped into the football club cafe for a quick cup of tea (only £1). Before we knew it, everyone had hit the road and it was time for us to do the same. We headed across to Crawley for some vegan lunch in The Loving Hut, which incidentally is just around the corner from Tilgate parkrun (my blog). It was another great morning of parkrunning and the Sussex set of parkrun venues was once again complete.